Santa Monica, California, is known for its beautiful blue skies, ocean views, the ferris wheel on the pier, and lazy days laying on the beach. But now, there is a new activity to add to the list when you visit: drink some Bloody Marys! Last Sunday, five neighboring restaurants located on the picturesque Ocean Ave. set out to compete for the title of best Bloody Mary at the Santa Monica Bloody Mary Battle. 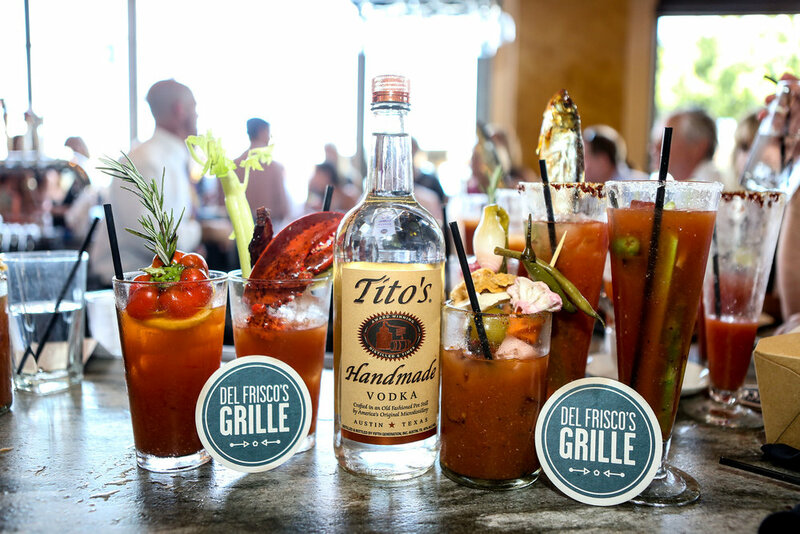 Hosted by Del Frisco’s Grille, and sponsored by Tito’s Vodka and Bloody Gerry, each restaurant sent their best bartender to throw down their most delicious and creative take on this traditional cocktail. The competitors were Joseph Matlock from Locado Del Lago, Christiana Gifford from Blue Plate Taco, Danny Matlock from The Lobster, Steve Triosi from Del Frisco’s Grille and Adam George from Areal Restaurant. “It’s about bringing the community together more then an actual competition,” said Adam of Areal Restaurant. “It’s also about bragging rights.” The winner of the throw-down would receive a cash prize which would be donated to a charity of their choice. “Drinking Bloody’s and raising money for charity? It doesn't get any better than this!” said the MC of the event Tyler Herdklotz. The gameplay was simple. Purchase a ticket for twenty dollars, and receive a flight of five bloody’s from each bartenders' personal mix set on top of a coaster listed A through E. Which ever three mixes you enjoyed the most, simply drop the coasters into the first, second, or third place box. The votes were then later counted, and a victor would be announced. With over three hundred Angelenos in attendance, this throw down was an amazing spectacle to be seen and tasted. Of course, it’s not always just about the mix is it. On display were some of the most impressive garnishes to be placed on top of a bloody mary cocktail. Joseph’s Matlock of Lago had served his with a deep fried sardine, when the crowd shouted “who’s going to eat the head?” guest judge Jeff Miller of the Thrilllist.com stepped up to the plate and bit the head right off. “How does it taste?” asked MC Tyler, “Salty and delicious.” The next most favorited garnish was a slider served up by Steve Triosi from Del Frisco's. “Now that’s a meal in a glass!” exclaimed guest judge, celebrity DJ Casey Conner. Another crowd pleaser was Adam’s of Areal restaurant who served a refreshing garnish of heirloom tomato and mozzarella cheese to compliment his freshly juiced heirloom tomato mix. When the time came to announce the winners, the bartenders lined up, and the crowd started chanting out their favorite restaurant to win. The winner of the day was Joseph Matlock from Lago, who received a combined check for a little over $3,000 for his chosen charity. Second place went to Steve Triosi from Del Frisco’s Grille, who received a gift basket of Bloody Gerry and Tito’s vodka. “I can’t believe I got beat in my own house!” laughed Triosi. Third place went to Adam of Areal. So, if you find yourself in Santa Monica this summer, be sure to head to Locado Del Lago, and taste this summer's winning Bloody Mary. Bloody Gerry Premium Tomato Beverage Mix will be available for sale online in August 2015. Guest Author: Sam Parador Photo Credit: All photos courtesy of Jennifer Karp.